Evangelical Christians are far less likely than the general public to say humans cause climate change. But one group wants to change that. 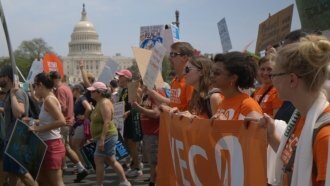 The Young Evangelicals for Climate Action want to change the way many Christians think about climate change. About 1 in 4 Americans identify as an evangelical Christian. Despite scientific consensus, they're far less likely than the general public to say human activity contributes to global warming. So this group points to scripture. "God calls us to be stewards of the Earth," YECA member Shannon Farmer said. "Why just sit aside and say, 'Oh, well God will just let things happen and let the Earth burn.' I don't really think that that's what he's about. I think that it's about restoration and coming into communion with other people and following what he wants us to do, obeying his commands to love thy neighbor. And I think part of loving thy neighbor is taking care of the Earth." Now the organization is taking the fight to Congress. They're pushing conservative Christian lawmakers to support limits on carbon emissions that warm the planet. "We've had lots of meetings already, lots to come," YECA spokesman Kyle Meyaard-Schaap said. "We're having 38 meetings all told today. They don't often hear from this constituency on this issue. What we want to emphasize most it's that there are evangelical Christians who do care about climate change, who accept the science of climate change and who want to see the leadership of the Senate move climate policy through Congress."